Since we started this website, we noticed numerous visits from our Anglo-Saxon internet users. So we decided to translate in English some articles to offer you a better understanding. Some departure never knows any return. The one of Hirta’s inhabitants mark the end of a people more than four thousand years old and the one of a realised utopia. During the First World War, the archipelago knows a daily contact with the continent. Indeed, the Royal Navy settles a radio station on Hirta. In 1918, a German submarine arrives then in sight of the coasts of the island and starts to aim at the station, creating panic among the inhabitants and sheep. Those contacts, more and more regular, – and sometimes brusque! – finish destroying the cohesion of the community which rested on solidarity between its members. 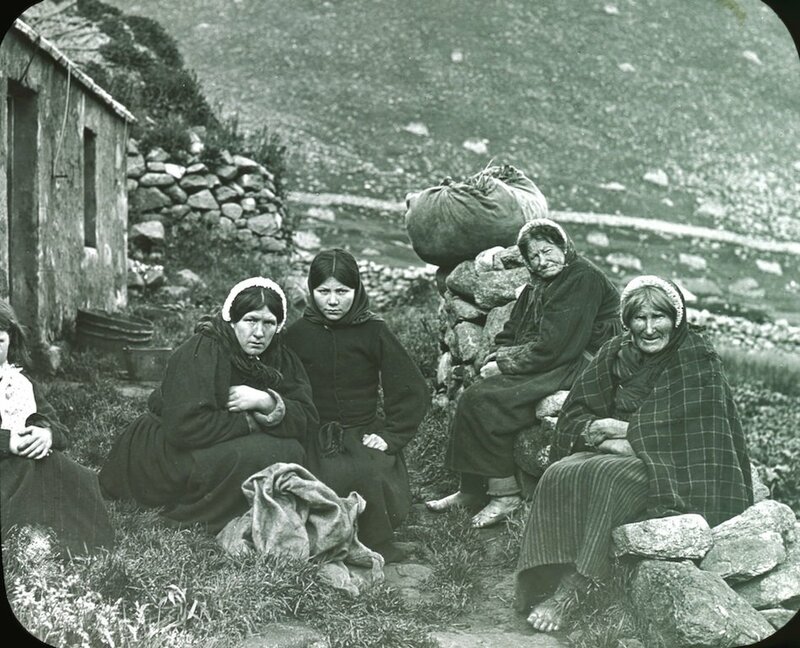 The women of Hirta are ready to leave St Kilda. August, 29th, 1930. Hirta’s population fluctuates over the centuries. At the end of the XVIInd century, nearly two hundred souls populate the island. Life difficulties and illnesses decrease this number. During the XIXth century, the population is estimated at about a hundred persons. In 1851, 36 persons choose to leave the island to Australia, striking a blow to the community again. The regular contacts with the continent bringing new illnesses, the number stabilises between 75 and 80 inhabitants. In the twenties, numerous young people leave the island and the population falls under forty persons. Flu also kills a lot and the harvests are bad. Indeed, the soils are poisoned by the corpses of birds used as fertiliser. The community is dying, the departure is just a question of time from now on. The 26th of May 1930, Mary Gillies, 13, died from appendicitis. 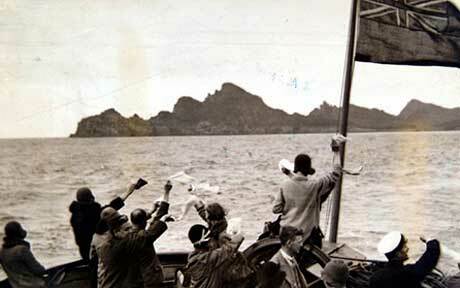 Nevertheless, the islanders warn the continent thanks to a bottle thrown in the sea. A boat is chartered from Glasgow and sails to St Kilda, with the hope to arrive in time to save the teenager. Alas, the bad weather prevents from coming alongside, and she passes away before any doctor could help her. That’s the limit for the 36 islanders left who demand their evacuation. 29th of August 1930, 7 a.m., turmoil prevails on Hirta. In one hour, the last Hirta’s inhabitants will get on board the HMS Harebell to Movern, in the Highlands. Everyone is busy, finishes packing, cleans for the last time the breakfast table and is ready to leave this familiar environment forever. The sea is quiet, the sun is shining, we could almost forget the harshness of the living conditions on the island in the mildness of this lovely day of an ending summer. The islanders bring their luggage on the boat as well as some sheep, not very happy, and the six cows present on the island. At about 9, it is time for departure. On the deck, children are playing whereas adults try to show happiness. Leaning on the rail, they watch the Conachair cliffs disappearing and the long Dùn Island, those familiar coasts which had always represent their living environment. St Kilda disappears little by little from the eyes of the former inhabitants and on the blazing ocean, the islanders start to cry for the loss of their houses. Goodbye St Kilda, August, 29th, 1930. For lots of them, this departure is an absolute heartbreak. A few times after their arrival on the continent and in spite of the welcome they receive on Movern, the former Hirta’s inhabitants feel totally uprooted. Some of them fall ill, others suffer from depression. A lot of them cry when they think of the island and the village they left. They try, as best as they can, to get used to their new life. They have never seen a tree before in their life and now, most of them are working in management and maintenance of the local forests. Right now, there is only one person left who was present on the HMS Harebell this 29th of August 1930: Rachel Johnson, born in Hirta, 93 years old now, 8 when they depart. A more and more distant memory. Clément B. , translation by Valérie G.
Tags: end of St Kilda, Hirta, Kilda's evacuation, Scotland, St Kilda, St Kilda departure 1930. Bookmarquez ce permalien.